Hoffman Concept® 1-Door wall mount hinge enclosure has type 304 stainless steel construction with brushed smooth finish. 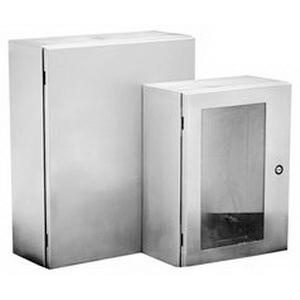 Minimum width, externally formed 90-degree body flange of this enclosure offers maximum body opening. Remove the interchangeable corner-formed doors by simply pulling clip style hinge pins. It has panel mounting studs that accommodate optional Concept® panels and other accessories. It measures 12-Inch x 12-Inch x 6-Inch. Mounting holes in back of enclosure body facilitates direct mounting or for optional external mounting brackets. Enclosure has type 316 stainless steel hidden hinges that promote clean aesthetic appearance. It features seamless foam-in-place gasket, self-grounding latch system with double seal and quarter-turn latches with flush slotted insert. It provides provision on door for thermoplastic data pocket and optional doorstop kit. Clear polycarbonate window allows quick inspection and maintenance of internal electrical or electronic devices. It is suitable for indoor or outdoor applications that require corrosion protection from chemicals and water. Enclosure is UL listed, cUL listed, VDE certified and meets NEMA/EEMAC as well as IEC standards.